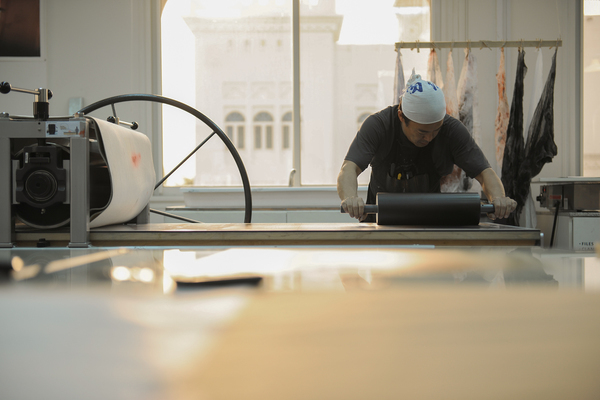 Koichi Yamamoto is an artist who merges traditional and contemporary techniques so as to develop unique and innovative approaches to the language of printmaking. His prints explore issues of the sublime, memory, and atmosphere. Koichi has worked at many scales, from small and meticulously engraved copper plates to large monotypes. He completed a BFA at the Pacific Northwest College of Art in Portland, Oregon and then moved to Krakow, Poland, later he studied engraving at the Bratislava Academy of Fine Arts in the Slovak Republic. Koichi also studied at the Academy of Fine Arts in Poznan, Poland and completed an MFA at the University of Alberta, Canada. In addition he has worked as a textile designer in Fredericia, Denmark. Koichi has exhibited internationally. He has taught at Utah State University and the University of Delaware and is currently an Associate Professor at University of Tennessee, Knoxville.